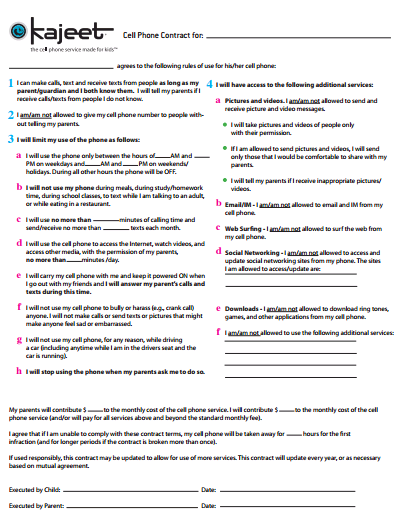 Creating A Child Cell Phone Contract! The challenge of child cell phone use is still very much an open debate, and will likely remain so! Whether or not you feel that kids should or should not have their own cell phone, and at what age, the fact remains that there are a lot of children out there who do have access to their own mobile phone. Thus, learning how to best manage their usage is a good use of a parent's time. Kajeet, the cell phone service made specifically for kids, has based its entire business on providing tools to help parents manage the safety of our kids, while meeting the needs of children growing up in a mobile-centric world. If you haven't already, you can learn more about Kajeet's parental controls by visiting Cell Phones for Kids. Make Them Sign A Parent-Child Cell Phone Contract! Children will only communicate with people whom they know, and if they get a call or message from someone they don't know, they will tell their parents. Kids are not allowed to give out their mobile number without permission from their parents. They will use their phone only during days and hours agreed to by their parents, including times where usage is inappropriate (ex. during meals, at school, while driving, etc.). Parents can choose to specifically define these times in the contract. Kids will agree to keep their phone on while out with their friends and answer calls/texts from their parents within a reasonable amount of time. Children can take and send pictures and videos so long as they'd be willing/comfortable letting their parents see them. They can access websites on their phone as allowed by their parents (sites are listed in the contract). It defines how much money parents and children will contribute to the monthly bill. There are some other details and goodies in the sample child cell phone contract sample. Overall, I think the contract is well thought out, fairly comprehensive, and simple and easy to understand. I feel that putting something like this together with our kids is a fantastic idea, and shows a thoughtful communication technique.